Unique and exciting, our adventure weekend is just the perfect way to experience a mix of adventure activities on this awe inspiring coastline. You’ll have the chance to take part in three half day adventure activities, choosing between coasteering, sea kayaking, surfing and coastal walking. There is even the opportunity to try additional activities such as kiteboarding, horse riding, and jet boat rides if you opt for a longer weekend stay. 2. …and you’re definitely going to get wet! But that’s ok! We provide high quality specialist equipment for your adventures — including wetsuits and socks to keep you warm! Preseli Venture is a fully professional adventure centre, with a fantastic purpose built equipment store and changing facilities here on site. So, there’s no hiding behind towels on the beach, we’ll fully kit you out before we set off in our minibus for the activity location. You will need a few essentials though, so do check our list before you pack your suitcase! The Preseli Venture eco lodge is Wales’ only 5 star activity centre built with sustainability in mind, accommodating up to 40 people in comfortable bedrooms which include singles, doubles, twins and larger family rooms. All bedrooms have either under-floor heating or radiators fed by our ground source heat pump, and bathrooms are all modern wet-rooms with under-floor heating throughout, so you’ll be warm and cosy at all times. There is a courtyard in which to enjoy the sunsets, a sheltered bonfire site for nights under the stars, a large bar and dining area with pool table and awesome sound system — all in the middle of a beautiful coastal National Park! 4.…and you won’t have to do any cooking! All your meals are provided, and you can look forward to hearty home-cooked food freshly prepared at the lodge, to refuel after your adventures and get you ready for the next one. We use Pembrokeshire food providers wherever possible so your food will be fresh, tasty and local! We cater for all, so if you’re vegetarian, vegan, have food allergies or intolerances, then just let us know in advance. There’s complimentary teas, coffees and cold drinks available at all time, and for socialising after an exhilarating day having fun, our Eco Lodge has a fully licensed bar stocked with a superb range of Welsh drinks amongst others. 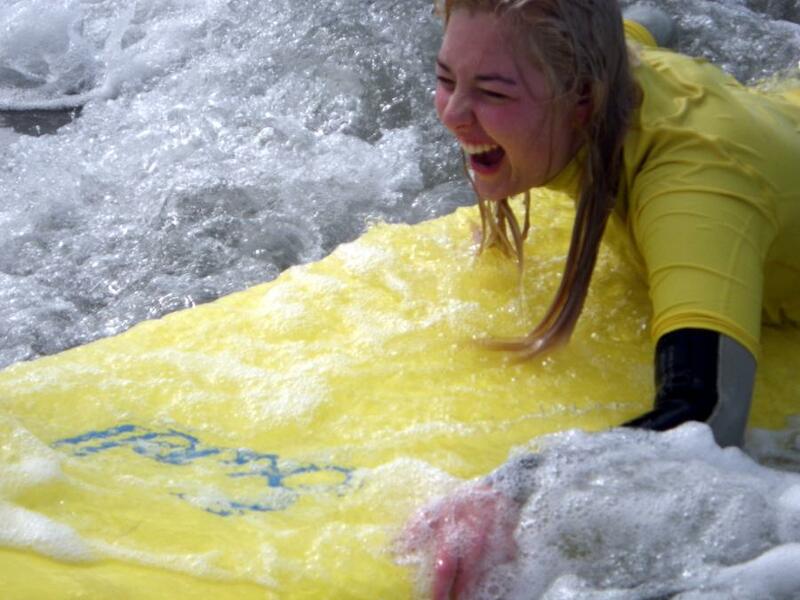 All of our friendly guides and instructors are experienced and fully qualified with National Governing Body Awards for the adventure activities, First Aid, and surf life-saving certificates, and they regularly take part in comprehensive in house training. They are committed to providing exciting yet safe activities that bring new challenges to the group and individual. To take part in the activities, you don’t need to have previous experience and you don’t need to be particularly ‘outdoorsy’, just come equipped with a ‘go for it!’ attitude and the need to experience something new. 6.…and you’ll meet some new people! Most weekends are a mix of individuals, couples, and groups, all adults of 18 years and over, so there’ll be the opportunity to meet and get to know others who’re looking for adventure, and exhilaration in this wild and beautiful part of Pembrokeshire. Our adventure weekends offer escape from the reality of daily life, the chance to refresh and invigorate, and the space to chill-out and relax. It’s a great environment to meet and bond with others, so you may make some great new friends by the end of your stay! We have a lively community too on Facebook and Twitter so come along and join in. Coasteering is the ultimate coastal adventure, and a great way to enjoy a fantastic wilderness experience. Climb, swim and jump into a whole new world, explore the sea caves, rocky arches and secret channels hidden along the coast. Sea kayaking enables you to see the stunning Pembrokeshire coastline from the sea, explore beneath towering sea cliffs and into sun-dappled caves, weave your way through amazing rock gardens and enjoy the exhilaration of surfing through rocky channels as you go “rock-hopping”. Surfing with the help of our expert guides, you may find yourself standing up and riding those clean ocean swells in no time, enjoying the thrill of the breaking waves, and the beauty of our perfect unspoilt beaches. 8.…and you won’t need your car for the whole weekend! Public transport to our little corner of Pembrokeshire is pretty decent, and we offer free train station transfers at certain times. Also we provide minibus transport to take you from the Eco Lodge to the areas of the coast we use for the activities, which allows us to visit some truly special places, and reduces our impact on the local community and beautiful environment around us. For the self guided coastal walk, we drop you further down the coast and you can enjoy your cliff-top hike along the coastal trail ending up back at the Eco Lodge. As we explore the beautiful coastline during the weekend, you will come face to face with some of the amazing coastal wildlife that occupies this part of North Pembrokeshire. Swooping sea birds such as razorbills, guillemots, shags and gannets majestic in their wild surroundings, swathes of wild flowers along the coast, and for the lucky ones, the possibility of meeting some friendly Atlantic grey seals whilst kayaking around sea cliffs, and porpoises and dolphins which may be glimpsed whilst out coastal walking. 10. …and see some secret unspoilt areas of the Pembrokeshire coastline! Our professional adventure guides will take you out to the best untouched and rugged wilderness locations on the stunning North Pembrokeshire coastline. Also Preseli Venture works together in partnership and is licensed by the National Trust as the principal operator using their wild and pristine coastal properties that are located close by for coasteering and sea kayaking activities. This means we can offer adventure activities at many uniquely special National Trust owned Pembrokeshire locations, and give you the chance to experience some outstanding and unforgettable natural scenery. If you want to experience our Adrenalin cocktail adventure weekend, or want to try one of our other adventure holidays in Wales, then please do call us on 01348 837709 or contact us to find out more. We’d love to hear from you!